With so many types of mobile camping options on the market, pop-up campers have remained an outdoor enthusiast’s favorite for many decades. What makes pop-up campers different from the other more common forms of mobile camping such as RVs and fifth wheels, is that they are relatively more affordable, and can completely collapse into a small portable package due to its partial-canvas construction. This makes storing them when not in use and driving them much easier to manage in comparison to a full-sized trailer or RV. But how did these advanced tent trailers come to be? This requires taking a trip back in time just about over a century ago. If we take a look back at history even further, one could argue that the very beginning of the car camping ideology originated from the gypsies who traveled throughout Europe in the 1800s. These gypsies had caravans in which they were fully capable of living out of, as they were constantly on the move from place to place. It’s important to note that prior to cars in America, the general population had only two main methods of transportation. The first was the railroad system. Although trains were capable of taking people through long-distance travel, it was very limited. There was a strict time schedule to follow and it didn’t always get you where you wanted to go. Prior to RVs becoming popular, it wasn’t uncommon for people to camp inside of private rail cars that pulled to sidings along the train routes. The second main transportation system was by horse. This method of transportation had more flexibility in terms on not being stuck following a specific track like trains, but it was very rare that people traveled more than just a couple of miles from home by horse. Inevitably, as people started having the freedom to travel long distances more easily, they would soon develop a deep interest in visiting national parks and camping with their families. In the early 1900s cars rarely had extra room for any type of storage space. This is what would ultimately cause innovators to start experimenting with new ways to add more storage space to their automobiles. Thus, the new idea of the pop-up camper was born. In the early 1900s, there were three main types of auto camping prior to the invention of the tent trailer. The first was a special rigging such as ones made by Tentobed Company, which allowed you to sleep inside your car. The second type of car camping was a type of running board which worked similarly to a fold out bed. It was stored on the side of the vehicle and could be extended out with a canvas tent covering the top. One of the most popular models of these types of kits were from L. F. Schilling which featured a 48 inch by 78-inch-wide double bed. You could essentially have up to two beds with this method, one on each side of the car. The third method came from the auto trailer which started becoming popular near 1912. The auto trailer method was especially popular in the western states, as a way for people to tow all their camping gear with them. Even after the invention of the tent trailer, these three methods would remain fairly popular for many years. When trying to determine who developed the first pop-up camper, it’s nearly impossible to point fingers at a single person responsible. This is because people had been camping in tents way before the invention of automobiles. As cars started to rise in popularity in the 1900s, people started becoming more interested in exploring the previously unknown. It shouldn’t come as too much a surprise that Americans tend to be explorers by nature. After all, that is how the colonization of the United States came to be. There were also a number of workers such as farmers, who would have to travel long distances to be able to sell their goods in town. Naturally, this passion combined with the growing popularity of cars would ultimately lead several innovative people to collectively discover new ways to combine a tent with their car. Until 1916, these innovations were typically just created as one-offs. It wasn’t till 1916, that the first tent trailers would become mass produced by well-known names within the trailer industry. One of these well-recognized names included William. P. Shattuck who was the first to submit his patent in January of 1916 for his Shattuck Trailer, and the Prarie Schooner. Both of these patents featured a towable trailer, with canvas roofing which was marketed as being able to be converted in just under 10 minutes. By the end of the same year, there were at least seven other companies that had started manufacturing tent trailers following Shattuck’s lead. These companies included Twin Bed (Sorlien Ceiling and Bed) Curtis, Marx, Cozy, Portable Camp Company, Auto-Kamp and several more. From 1913 through 1924, a group of infamous men known as The Vagabonds drew national attention from the media. Among these men were Thomas Edison, Henry Ford, Harvey Firestone, and naturalist John Burroughs. The media would widely cover their adventures as they would caravan for their annual car camping trips. During these trips The Vagabonds would sleep in tents and tow a custom Lincoln truck outfitted as a kitchen along with them. This media coverage inspired a deep desire to go car camping from the general public. Unfortunately, by the 1930s the financial restraints of the Great Depression combined with Americans involvement of World War II, would cause car camping innovations to come to a halt. Only a handful of manufacturers such as Gilkison and Chenango were able to survive during this time. 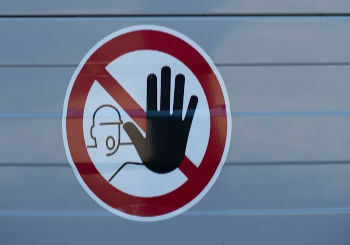 Some people had sought out travel trailers which could be purchased from as low as $500, as inexpensive homes. Sadly, by 1950s even these manufacturers had disappeared from the tent trailer scene as well. After World War II had ended Higgin and Karriall Kamper dominated the tent trailer market. By the late 40s, people started introducing new technologies to their travel trailers which included the use of plastic and fiberglass. Higgins ended up becoming the first to introduce the use of aluminum in his travel trailer by 1946. Despite these new innovations, neither companies were able to survive the recession by 1948. Although there remained a few manufacturers for tent trailers in the 50s, many people had resorted to building their own. 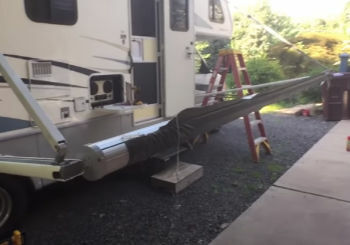 Magazines such as Popular Mechanics and Popular Science featured several articles which had detailed written instructions on how to build your own tent trailer. In 1953 Theodore Heilite began to mass produce his single wheel aluminum tent trailer. In the next year, in 1954, Hille Engineering would introduce the first mass produced fiberglass body tent trailer, although unfortunately it’s high price tag would cause it to fail commercially. Throughout the rest of the years in the 1950s camping became popular once again. This new demand fueled industry leaders Apache, Nimrod, and EZ Kamper. Camping trailer designs during this time continued with traditional features such as tent-tops, over-end beds or tent-on-the-ground models. During the 60s, the rest of the industry had finally caught up to the Ranger design which would feature over-end beds, hard top and lift systems and longer trailer length allowing more living space. Although truck-mounted campers had been around for at least 30 years prior, David Rowe had designed the first lightweight truck mounted pop-up camper in the early 70s. This creation was inspired by a quest to make hunting in the Rockies easier. The truck mounted camper shell had the ability to compress down into a low profile more for casual driving. When it was extended, it had six feet and six inches of headroom, a bed, a kitchen, and a variety of other amenities depending on the model. These type of pop-up campers are still being used today and known more formally as Four-Wheel Campers. Today there are hundreds of towable and truck mounted pop-up camper varieties. 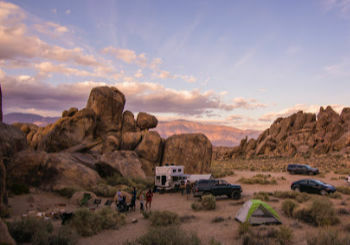 Although many of the traditional features of pop-up campers throughout history are still being used, we are still continuing to see new improvements and innovations of pop-up campers all the time. In 2001, the popular car manufacturer, Pontiac, had released a unique SUV named Aztek which offered a camping package. 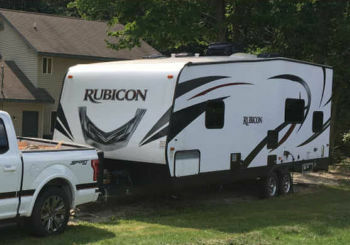 This camping package which was only $195, included a pop-up tent which attached from the roof rails to the wheel well, inflatable mattress and a cooler. All of which could be set up within just 10 minutes. Today there are hundreds of custom rooftop tents that can fit just about any car. Believe it or not, there are even pop-up campers made for Mini Coopers. Just last year in 2018, Leentu became the first modern truck fitted pop-up camper to weigh under 150 pounds. This lightweight pop-up camper is offered in two models, lightweight fiberglass and ultralight carbon fiber and is capable of fitting all Toyota Tacoma long bed models from 2005 and newer. Towable pop-up campers today range in price from as little as $1,000 to an upwards of $20,000. These travel trailers can weigh from 800 pounds to well over 2,000 pounds. Some of the fancier models can even feature showers and toilets. One really ingenious recent pop-up camper was created by the Dutch company Udo Camp. What makes it so unique, is its ability of going from a short storage trailer to a full-size camper in just 30 seconds by the single touch of a button. 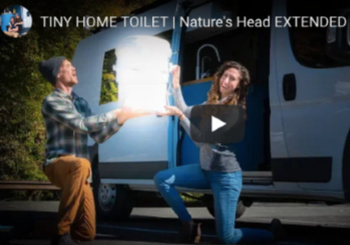 Of course, if you’re not ready for the financial commitment that these travel trailers require, there are also hundreds of websites available today where you can rent a pop-up camper for the weekend usually ranging from $50-$100 per night. 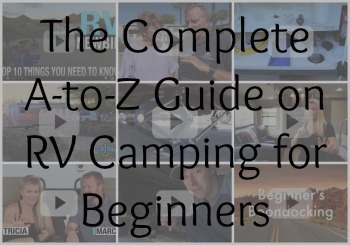 By renting a pop-up camper, you can have the freedom to try it before you buy it. It’s really interesting to see throughout the last 100 years, all of the innovative creations that have resulted from our instinctual passion to explore the great outdoors. 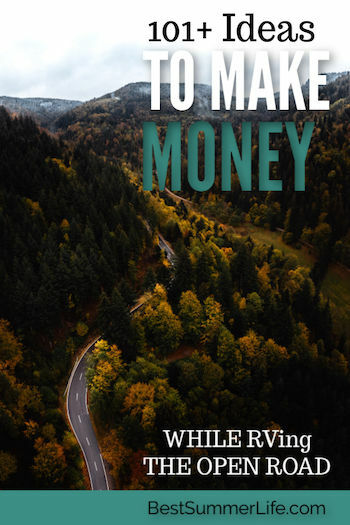 Although you should always do your research before making the investment, pop-up campers have always been the ideal choice for those who desire the RV lifestyle without the full commitment. One thing is certain with pop-up trailers, and that is, no matter where you take it you’ll surely make lifetime memories and great bonding experiences.